Many home owners are preparing to sell their homes this year. And in doing so, home sellers are looking for new and exciting ways to sell their homes fast and for top dollar. But the reality is that selling a home is not rocket science. There really isn’t a secret trick or approach to selling a home. Rather, it’s more like magic, where properly performed fundamental tasks can set the stage for a satisfying experience. If you don’t know how Occam’s razor (or what it is) can help you get the most from your home sale, pay close attention. First, consider the condition of your home. Do you have deferred maintenance issues? Does your home need a makeover? Homes that get top dollar are “turnkey.” Many home buyers are willing to compete and pay more for recently upgraded and renovated homes. Selling a home with deferred maintenance or lacking recent updates can not only turn off many home buyers, but can encourage low-ball offers. A pre-listing home inspection can help you identify maintenance issues. Also, consider consulting with a design professional to help you understand which updates (if any) are necessary to help your home sale. Next, work on the home’s presentation to give it a clean and spacious feel. Decluttering is one of those tasks that can be overwhelming, but it’s importance cannot be overstated. Decluttering will force you to decide which items to keep in the home. Additionally, staging your home can help balance space, furniture and décor. This can help home buyers envision living in the home. Deciding on a list price is often a conundrum. Although enticing, don’t be seduced by the agent who tells you the highest sales price without understanding their rationale. The housing market can turn on a dime. If your home isn’t priced correctly, it can languish on the market. There are many aspects that go into deciding a price, so work with a respected seasoned agent to go through the market details and scenarios. Finally, when the home is ready to list, how is it to be marketed? Today’s MLS listing syndication takes advantage of the fact that most home buyers actively search homes on the internet. Don’t rely on gimmicks that promise activity on your listing. A complete marketing plan will take into account the factors we discussed here, and apply strategies to attract motivated home buyers. I often preach about regular home maintenance. However, home owners should also have basic home repair skills. Basic repairs are those items that you can do safely, and usually don’t require a professional. Basic home repair skills are sometimes useful as an emergency stopgap before the licensed contractor can make it to your home. Basic home repair requires a few tools. Keep a toolbox well stocked and know where it is so you can easily find it when necessary. Besides the standard hammer, Philips and flathead screwdriver, your toolbox will need more items depending on your skill level. If you’re in doubt about your ability to make a basic home repair, call a licensed contractor (you can do more damage if you don’t know what you’re doing). As a precaution and in case of emergency, you should know where the emergency shutoffs are in your home for water, electric and gas. One of the first repair skills that I learned as a home owner is how to “snake a drain.” Bathroom drains, specifically, get clogged with hair and soap. Chemical products are a common solution, however you should always follow the directions and read the “cautions and dangers.” Chemicals don’t always work well, however. If used improperly, chemical drain products can also damage basins and pipes. Following the instructions, you can easily clear most clogs with a drain snake. A small drain snake should be part of your tool box. These are cheap to purchase and readily available at the hardware store. Have you ever needed to change your door locks quickly? I have, once when a lock failed (the mechanism broke), and another time when someone stole our keys. Although most locks can be changed out easily with a screwdriver, specialized locks require a locksmith. Most locksets are designed as components that easily install. However, you should note that standards change over time, so make sure the lockset you purchase is the same size as the one being replaced. Patching drywall is one of those repairs that is so basic that you can find “how-to” tutorials everywhere. Basic drywall patching requires a few basic tools, such as a “spackling tool,” utility knife, sand paper and spackle. Spackling tiny pinholes is easy. However, a larger hole may require some time for the repair as well as the clean-up. Damage to large areas of drywall will most likely require sections to be replaced. Can’t find the leak from your sink or tub? There’s a good chance it’s coming from water that is seeping through old caulking. Caulk is used as a sealant in plumbing applications. It seals the fixtures and perimeter of sinks, tubs and shower stalls, which prevents water from trickling through. As it ages, caulk shrinks and can become brittle, which allows water penetration and leaking. A tube of caulk should be in your toolbox in case you need it for an emergency repair. You don’t need a large caulking gun, as caulk is available in many forms, such as squeezable tubes and even tape. Plastic sheathing and duct tape are both good to have in your toolbox in case of an emergency. Duct tape, specifically, has many uses and is widely used as an adhesive and sealant. These two items are useful as a short-term repair for broken windows and doors. Plastic sheathing and duct tape can easily cover the affected areas until they are replaced, as well as help maintain cooling or heating in the interim. 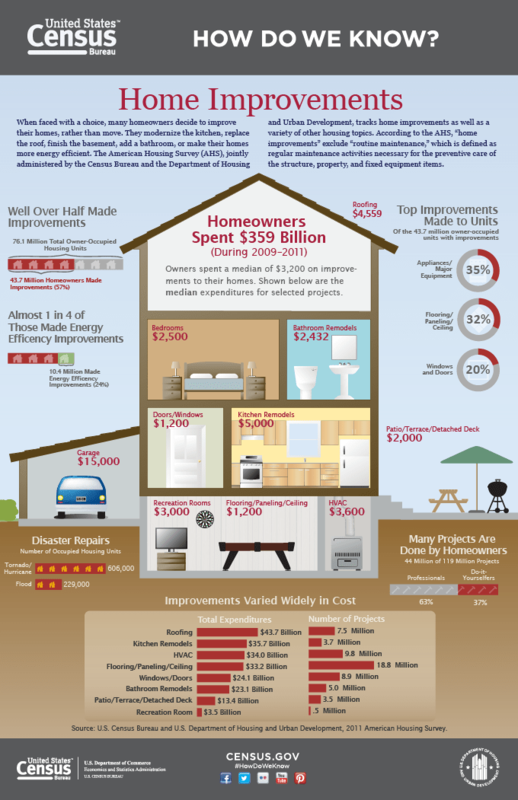 Home owners are spending more on home improvements. “Do-it-Yourself” (DIY) projects are becoming popular again. Besides being inspired by the increasing number of DIY home improvement shows on TV, there are numerous books, online sources and YouTube videos to show a DIYer how to take on almost any project in the home. Being a DIY is ambitious and exciting, but for many becomes overwhelming and costly. The notion of DIY is more than just being proud of getting your hands dirty. For many home owners it’s really about money. DIYers have a reputation for being thrifty, but a revealing research analysis asserts there’s more to it. Ryan H. Murphy (The Diseconomies of Do-It-Yourself; The Independent Review; Fall 2017; pp.245–255) provides ample evidence that many who engage in DIY have an anti-market bias. Those who engage in DIY home improvements believe it is a zero or negative sum game, where there is no benefit from money spent on the home improvements. He concludes that unless home improvement is your vocation, you’re better off sticking to your profession and hiring a (licensed) professional home improvement contractor. One of the issues that is often noticed with DIY projects is that the result may be substandard. The home owner may decide that although the project is not completed, it is “good enough” to save time and money. Sometimes, the “good enough” attitude is evident by jerry-rigged components. This can obviously be a problem when selling the home. Home buyers have a keen eye and will be turned off by poor workmanship. Even if the home buyer misses it, you can count on a home inspector to flag it. Permits seem to be another issue for many DIYers. Some believe that obtaining a permit (when it’s required) is costly and time consuming. However, inspectors are getting better at sniffing out unpermitted projects, so it is common for the DIYer to get caught before completing their improvements. The permitting process may increase the time and cost for your DIY project, but it’s there to assure that buildings and home improvements adhere to the building and zoning codes within the city or county. Building and zoning codes are devised to help ensure that buildings are safe. Finishing a project without a required permit can potentially cost you more money and time down the road. If you are required to get your unpermitted DIY project inspected after completion, don’t be surprised that you may have to make alterations and/ or corrections to your work. If you built a structure that is deemed unsafe or even encroaches on a neighbor’s property, you may even have to demolish the project and start over. You may even have to hire contractors to assist you. If you are selling your home, the home buyer may require you to have your work inspected. It can be even more costly if the project was completed during past code cycles, because, rather than send county inspectors, you may be required you to hire experts to inspect your work. If you’re planning a DIY project and not sure if it needs a county or city permit, check with your municipality’s permitting office. Here in Montgomery County MD, the Department of Permitting Services’ website lists additions and alterations that require permits (permittingservices.montgomerycountymd.gov). However, if you live in one of Montgomery County’s county’s incorporated cities, your city may have different permitting requirements. I talk about home maintenance quite a bit. And there is a reason. Maintaining your home is important, not just to keep you comfortable but to also preserve your investment. But many people loath the idea of spending their weekend checking their home’s systems, replacing air filters, mowing the yard, washing the siding, cleaning appliances, ad nauseum. They are called chores for a reason. But maybe sometime in the near future we will eliminate the chores and live in maintenance free homes. Rapid technological advances are certainly making our lives easier. We can do many things in our homes, even when we’re not home! Our homes can even do things while we’re not home. So how about increasing the quality of our lives by reducing the time spent maintaining our homes? Home design and materials tech are leading us to a home where maintenance is minimal or non-existent. Tech innovations has brought us new materials to enhance our homes’ appearance and decrease maintenance. Many of the new materials not only look good, but they are also green which makes our homes more efficient. 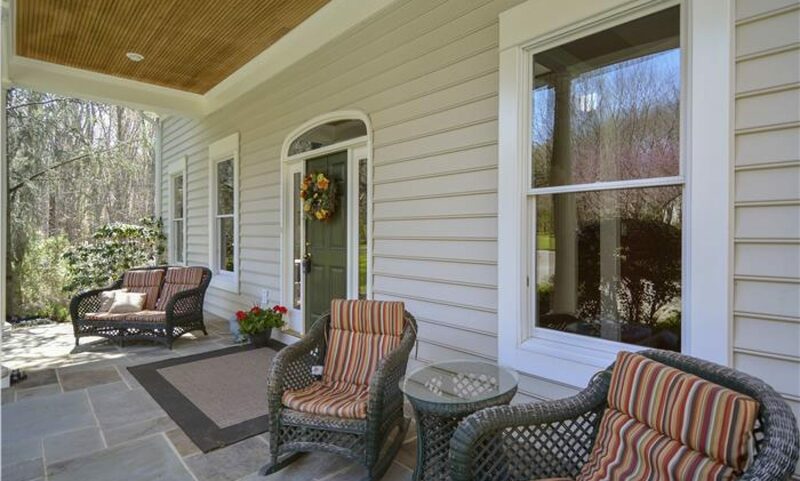 Many material improvements have been primarily for your home’s exterior. For example, new no-maintenance or minimal maintenance materials for siding, decking and roofs are aesthetically pleasing and can last decades. However, low or no maintenance materials for your home’s interior are increasing in popularity too. Examples include quartz for counters, and prefinished wood for flooring. The desire for maintenance free homes is not a new phenomenon and can be directly observed by housing choices. New home buyers like the idea that there will be minimal maintenance for the first year. They like feeling confident that everything in the home will work as expected without spending money on service calls, or expensive emergency repairs. Condo buyers like the idea of not having to deal with exterior home maintenance, especially lawn care. Additionally, active adult communities are designed with low maintenance in mind to make living easy and increase quality of life. Unfortunately, because of their design, some mechanical systems still require care. For example, experts recommend that HVAC systems be serviced twice a year. The service not only checks and tunes the system to operate efficiently, it can identify potential hazards as well. However, to help keep maintenance at a minimum, many homeowners decide to sign up for a service contract. The service contract may also schedule the maintenance for you, which can also help you with time management. Not all service contracts are the same, and due diligence is recommended before you sign any agreement. I am not dissing those homeowners who love to work on and around their homes. Don’t get me wrong, there is a satisfaction from doing chores and repairs. But there are many who don’t care for it. And not to mention that there are many homeowners who don’t maintain their homes, because of cost and/or inability. A major benefit to living in maintenance free homes is reducing the value-reducing effects of deferred maintenance. Tech advances in home design and building materials have eliminated a great deal of the maintenance requirements that was necessary in the past. And although some systems in the home require regular care, newer systems increase in reliability. It’s fascinating that because of maintenance free exteriors many homeowners today don’t know what it’s like to paint the exterior of the house every two to three years. Likewise, maybe sometime in the near future, we won’t remember what it’s like changing air filters. After enduring the recent twenty-four hours of near hurricane winds, many home owners are making repairs to their homes. Many are reporting storm damage claims to their insurance companies. Anyone who has made an insurance claim to repair their home knows that it can be ordeal. But you can make the process easier if you know what to do. When making an insurance claim, the Maryland Insurance Administration recommends that you contact your insurance agent or company immediately to report damage. Prepare a detailed inventory of all damaged or destroyed property, to provide to the adjuster and for your records. It is recommended that you take pictures or video of the damage for documentation and to help the insurance company’s investigation. If emergency repairs are required, keep all receipts. It’s important to only make necessary repairs, and to contact your insurance company before making permanent repairs. You can view the Maryland Insurance Commissioner’s video on “Filing a Weather-Related Claim” for additional information and tips about your homeowners insurance (youtu.be/XywD4mdU1q8). Before you make a claim, check with your insurance company about your deductible, policy coverage, and how they will pay-out the claim. If total cost of the repair is approximately, or slightly more than, your deductible, making a claim may not be worth the trouble. Your homeowners policy may also limit repairs to only the damaged areas, resulting in mismatched roof or siding. If your mortgage company has to endorse the insurance check, contact the mortgage company to engage the process and expect a delay in reimbursement or contractor payment. Making an insurance claim may also have consequences on your insurance premiums and future applications. Much like credit reports that help creditors make decisions about extending credit, there are reports that provide the same to insurers. These reports help underwrite insurance policies. The “CLUE” report is a history of your insurance claims for the last seven years. A CLUE report can exist for you personally, as well as your home. Although the CLUE report has taken the public spotlight over the last decade, the A-PLUS property loss report is also popular with insurers. Much like checking your credit report annually, the Maryland Insurance Administration recommends that you annually review your CLUE and A-PLUS reports. The reports contain a detailed history of insurance claims for you and your property, as well as details about damage to your home. Knowing what is contained in the reports may help you understand how an insurance company views your and your home’s insurance risk. This can affect your insurance policy acceptance, limitations, and/or premiums. And like credit reports, you can dispute any errors on the CLUE and A-PLUS reports. The MIA website offers a list of contacts to help you obtain these reports (insurance.maryland.gov/Consumer/Pages/CreditandPropertyLossHistoryReports.aspx). It’s not uncommon to hear from contractors after the storm (verify contractor license). -Prepare an estimate of the loss. -Discuss the estimate with their customer. -Answer questions the insurance company has about the estimates. -Investigate, appraise, evaluate, give advice or assist their customer in adjusting a claim. -Prepare the insurance claim for their customer. -Negotiate the claim with the insurance company on their customer’s behalf. -Advise their customer on the insurance policy’s coverage. -Advertise or provide written materials that they can negotiate or investigate a claim on their customer’s behalf. If the hassle of filing a claim is too much for you, you might consider hiring a Public Adjuster. The MIA describes the Public Adjuster as, “…an insurance claim adjuster who, for compensation, acts as an advocate for the policyholder in appraising and negotiating a first party property insurance claim under a property and casualty policy that insures the policyholder’s real or personal property…” The Public Adjuster must be licensed by the MIA and enter into a contract with the policy holder, as well as provide disclosures. Although a convenience, your insurance company is not obligated to accept the Public Adjuster’s claim. -keep financial and business records and establish a separate escrow account for the policyholder’s proceeds. f. the insured’s rights under the Maryland Consumer Protection Act.